Born in Hove, England and named Val due to prior Valentines day. Inspired at age 7 by watching both his amateur father and The Great Carmo. Learned at age 8. Debut at age 12 (1938). Admiration for Arthur Prince made him become a ventriloquist himself. Performed under several names: The Great Valentine, Bronco, Val Vox the Magical Raconteur 1938-48, The Mysterious Vanson 1948-51. Pro performer since 1943. 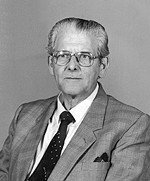 Prolific author since 1952 of over 200 booklets on various aspects of magic, six popularized magical biographies, and a number of Sherlock Holmes pastiches. His life partner was Terri Rogers. CHAPTER ONE: I Discover "The Great Carmo"
1st edition 2001, 80 pages; 1st digital edition 2019, 53 pages. Val Andrews sent this booklet to his customers during the 1988 Christmas season. It features stories and recollections involving Christmas and magic. 1st edition 1988, 12 pages; PDF 14 pages. 1st edition 2001; 1st digital edition 2016, 43 pages. Joke-shops, novelty-stores... are packed with "explosive" and surprise items which have far too long been regarded as "practical jokes", when, in actual fact, they can be used to good advantage by magi and other entertainers. This is an unbelievable book test. Just imagine taking a modern book; perhaps a best seller in the bookshops right now. The book is genuine and is completely unfaked in any way. You can even ask a member of the audience or perhaps someone on a radio show that you will be talking to, to bring along a copy of the Da Vinci Code or whatever you choose to use. Or you could do this impromptu with any book as long as you have a couple of minutes private time with the book. A spot of "juggling" has always been a safe bet as an interesting "change-of-pace" for the magician, particularly where he is presenting a long programme. "The Eggs And Glasses" has proved this point with its recent popularity (or "revived popularity") with both magicians and their audiences. The feat was hardly seen for a decade or so, then came a wave of popularity for the feat when it was discovered that "no skill was required" ... just confidence and "knack". This could very well be Val Andrew's most important work. He describes with several great examples and historical effects, how one can entertain and amaze employing nothing but simple audacious ruses or outright bluffs. If there is a showman in you, you will love these effects and ideas. If you rather rely on your bottom deal and classic pass, then you will probably not be able to appreciate the value of this information. On the use of "stooges"
Dear Idiots. . . . Many years ago a man called S. W. Erdnase wrote a book called The Expert at the Card Table . Any similarity between his title and mine is purely intentional. . . . After all, Mister Erdnase re-arranged the letters of my surname to make his! This is Val's own life story. Val is one of magic's most prolific writers and he draws from his vast magical experience as he recounts the story he knows best - his own. To people who know magic and the Show-Biz scene this is a marvelous recording to listen to. Val Andrews recreates the master in Tell Them You Saw Dante and takes you back to the days of Sim Sala Bim. Val Andrews impersonates Dante. A remarkable insight into Dante the man and the performer. Val takes us behind the scenes with this great performer and the whole recording is rather in the style of a radio broadcast featuring extracts from Dante. This recording was originally created and released by Val Andrews. In 1977 it was purchased by Martin Breese and is now owned and copyrighted by Lybrary.com.